RITES Limited, a Mini Ratna Central Public Sector Enterprise under the Ministry of Railways, Govt. of India is a premier multi-disciplinary consultancy organization in the fields of transport, infrastructure and related technologies. RITES Limited is in urgent need of dynamic and hard working qualified professionals for its various projects. control panels, switch gears etc. Reservation, relaxation & concessions to SC/ST/OBC/PWD/Ex-Servicemen would be provided as per extant Govt. orders. Log on through the website www.rites.com. Click on “Career” —> “Online Registration”. Check Once before submit the Application. Send documents to the below mentioned address. 8. The bank official will fill in the Branch Name, Journal No. and CBS Branch Code in the three copies of challan. Ensure that the bank official mentions the above three details when he/she stamps your challan. All eligible candidates shall be called for Written Test followed by Interview of top candidates (4 times the number of vacancies in each category) as per merit in Written Test. Merit list of only those candidates shall be prepared who secure a minimum of 60% marks in aggregate as well as in the Interview (50% for SC/ST/OBC/PWD). Appointment of selected candidates will be subject to their being found medically fit in the Medical Examination to be conducted as per RITES Rules and Standards of Medical Fitness for the relevant post. Certificate in support of claim of belonging to Scheduled Caste, Scheduled Tribe and Other Backward Classes, Ex-Serviceman or Physically Handicapped, where applicable as GOI prescribed formats. RITES Limited is in urgent need of dynamic and hard working experts for Ahmedabad Metro Project. Interested candidate can check all the details given below clearly before apply. 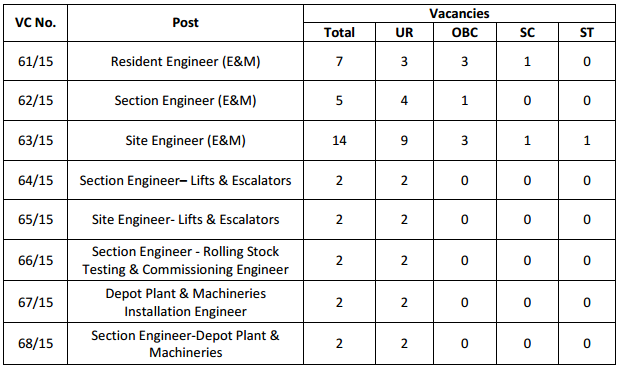 Vacancy details for RITES Limited Recruitment 2015 is given below category wise. The appointment shall be purely on contract basis initially for a period of one year, extendable until completion of the assignment subject to mutual consent and satisfactory performance. The selected candidates shall be posted in Ahmedabad. Out of all the eligible candidates, a shortlist to the extent of 5 times the number of vacancies shall be prepared (category-wise). While shortlisting, first preference shall be given to candidates having experience in Metro/Railway Projects, followed by other candidates. Merit list of only those candidates shall be prepared who secure a minimum of 60% marks in aggregate as well as in the Interview (50% for SC/ST/OBC).